As of January 1, 2008, we are under contract to provide our new "story-based" cultivation program to LBSA. They are planning a capital campaign and realize that major donor cultivation must be attended to first. We are working on a new manual and on-line training program which will be available in the near future. We are also under contract with NRC to provide our new cultivation program. NRC wishes to begin a $3 million campaign but needs donors identified and cultivated before proceeding. We look foreward to working with Kyle Nordine, CEO, and his marvelous staff on this important project. Our work on the PEBC campaign has come to an end. A significant percentage of the goal has been achieved and the board and staff are prepared to complete the effort. We stand ready to be of any assistance we can in this important campaign. To visit the PEBC website just click on the icon above. Although PEBC has been operating in the black since its inception, its membership base has not grown to the size that it needs to be. We have been working with the Executive Director and Board of Directors to develop an approach to affinity groups. There are a number of organizations that share the PEBC values and vision including Pheasants Forever and other wildlife groups. We have developed a variety of "story-based" fund-raising letters and will be sending one to each of 1,000 members of these different groups. A sample letter may be seen by clicking on the letter icon shown below. As you can see, we focus attention on the child who has experienced what the bus has to offer and who then writes a simple, yet powerful, "thank-you" to the folks at PEBC. This is a small, but important story that only the Ecology Bus naturalists can make happen. Our hope is that people who care about the natural world will resonate with the message these children are relating. For almost twenty years, we have been helping people (including ourselves) raise money. Whether its been for community projects, church buildings, arts and history organizations or radio towers, we have applied the fundamental principles of effective (and ethical) fund raising to make good things happen. Over time, we have convinced thousands of individuals and organizations to contribute millions of dollars to marvelous causes. We can do this for you as well. 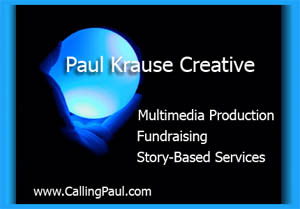 Just give us a call at 507.645.6735 or email Paul Krause (paul@callingpaul.com). To give you some idea how we work, we have included descriptions of a variety of past and current projects. In some cases, you will be able to view some of the campaign videos that we have produced in support of specific campaigns. We will also show you examples of "case" statements we have produced and grant proposals we have written. Each project has been a good story worth sharing. Speaking of stories, we have begun to apply the art of storytelling to our fund-raising toolkit. Since raising money is essentially about creating then deepening relationships between people, the use of the personal story is a perfect fit. 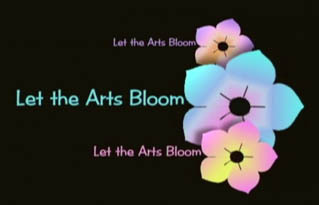 In 2001, we managed a major capital campaign for the Northfield Arts Guild. As part of the campaign, we created a short video. The purpose of the video was to remind prospective donors of all the different programs and activities that the NAG brings to the community. Video is the best communication tool to use if you want to engage, inform and inspire your contributors. Print is great for communicating the "hard facts" of the campaign, while video is best for communicating the "heart." Click on the icon below to view this 9 minute production. 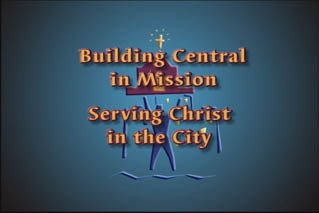 In 2002, we were asked to create a capital campaign video for Central. In doing so, we focused on the history of the church with special emphasis on the story behind the building of the current church building in the early 20th century. An emotional and inspiring story of struggle against the odds. Click on the icon below to view this 10 minute production.